Most of the garden was overgrown with (enormous) weeds so this had to be hacked back while trying to save a few plants (fruit trees and st john's wort were the only things that made it). The weeds were just the start of it. See the development page for more information about the rest of the mess we had to remove before we could start thinking properly about a garden. The first thing we decided to do was to grow climbers up the wall to soften the brickwork and also to discourage people from climbing on it (spiders definitely aren't discouraged). 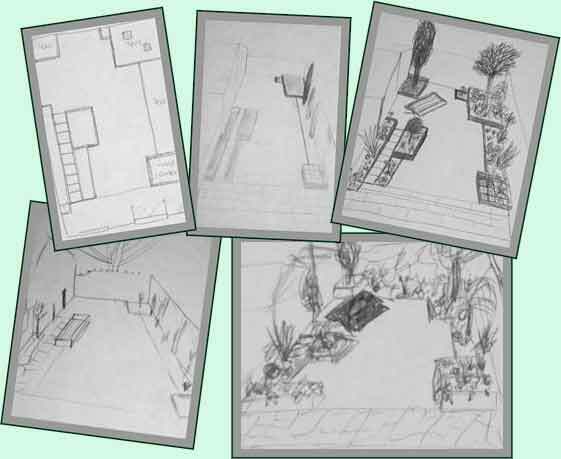 The following (very rough) sketches are a few of the early ideas for the layout. This is the layout that we first decided to aim for. At this stage we hadn't decided on the exact plants we wanted. We just had an overview of what we were aiming for. This is the plan we ended up with. Some evergreen plants so the garden stays interesting over the winter. A raised bed with bright colours in the summer. A little shady corner with a Japanese maple. 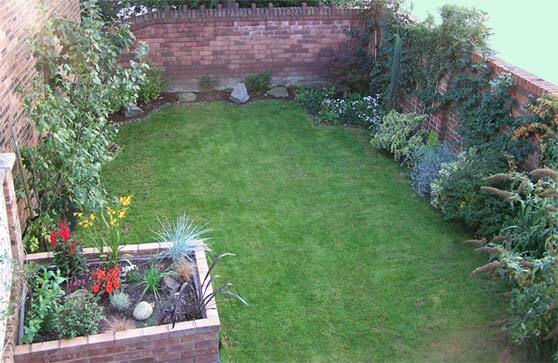 A number of plants to attract birds, butterflies etc. We also managed to squeeze in somewhere to sit and some edible things. We had to forfeit the planned path on the left when we found a grid hidden under a shed, gravel and a layer of concrete! We did try the seating area as it was on the early plan but the combined shade from the bench and the sycamore next door killed the grass (goo from the sycamore didn't do much for the bench either). The curved border evolved after we moved the seating area nearer to the house. Click on rollovers to see more images of the specific areas.